Who doesn’t want to play in the snow? Kids and young-at-heart adults are all looking forward to winter especially if they own a snow scooter. Even children as young as three years old can have fun in the snow instead of sulking inside the house all day long. If you are looking for the perfect gift for your loved ones and winter is fast approaching, we highly suggest that you opt for a winter scooter. Allow us to be your guide in choosing the right model for your receiver. Here are the top ten best snow scooters of 2018. 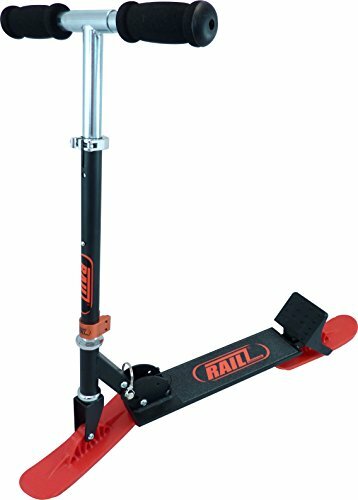 The Railz snow scooter is one of the leading models that you can choose from in the market. You can ride snow slopes with confidence. The stylish red and silver scooter can accommodate up to 200 lbs of rider. It’s ideal for both children and adult. The handlebar is quick to adjust, providing you full control of the scooter. Also, it’s easy to fold and carry around. In that way, you can bring it your favorite scooting site and enjoy the day. Recommended age of the rider is at least five years old and above. It’s great equipment if you want to play with the base layer of snow in your area. Issue with the ski bolt coming off. Your children will surely love the in-mold graphic design of the Pelican space scooter. It features a folding handle and non-skid footrest for safety purposes. And it only weighs 4.5 pounds for great portability since you can also fold it up when traveling. The recommended age of the rider is at least five years old and above. This scooter is great for beginners who want to learn snow scooting. All you need to do is fold it up while traveling, unfold when you reach the site, and you can scoot all day long. Not suitable for big kids. Another model from Railz is the neon green on black BD 5.0 snow scooter. It’s designed to last for an extended period. The Pro-Tough construction of Railz is enough to give you the confidence of scooting in deeper snow. Also, it features a quad stacked collar camp and welded front fork. The welded T-bar design provides full control while riding it. Also, the Hi-Performance Railz Pro-66 skis and Railz Sure-Stop snow break are designed for added safety f the rider. The scooter can accommodate passengers up from five years old and above weighing up to 220lbs. The Railz safety leash and logo sticker are both included in the package for free. It also comes with a few tools for a little assembly. In that way, you can assure your safety while riding the scooter. This scooter can be used in snow, dunes, and grass, providing great versatility to the owner. It features a multifunction LED Light Module at the top of handle to ensure maximum visibility when riding. This model from Geospace will allow your child to ride it freely on any smooth surfaces such as snow and grass (or even your carpet!). With just one easy push of your feet, you’re off to go. Also, the adjustable height-handle will help you to maintain your balance and assists when steering. The non-skid foot treads ensure your feet are sturdy a well-supported by the scooter. The high-quality materials are flexible, allowing you to have a smooth ride all throughout. The owner can also fold the handles for high portability and more comfortable transportation around. The scooter can accommodate riders weighing up to 250 lbs, a great scooter for both children and adults! Issues with missing LED lights. This model from Toysland is made out of super-tough but flexible material that will provide any rider a smooth ride. Also, it features a non-skid foot treads for extra safety. 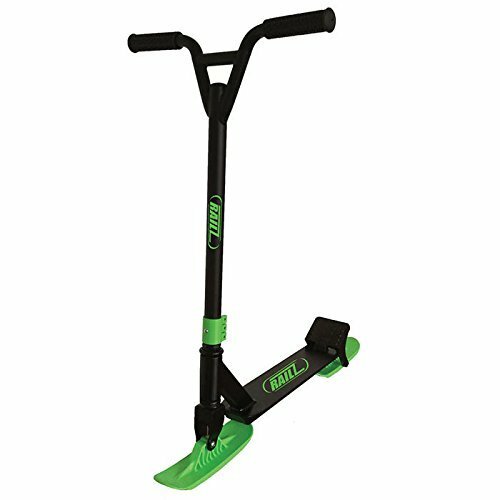 You can use this scooter on any flat and smooth surface such as snow, dunes, and grass. Similar to the other models of the manufacturing company, all you need to do is give it a slight push, and you’re good to go. The anti-slip footrests maintain the balance of the rider on the scooter. With the durable plastic design of this model, you can have fun this coming winter scooting around. This winter scooter can accommodate up to 220 lbs, suitable for both children and adult. Recommended age for children is at least four years old and above. If you are still a beginner in snowboarding, you should check out this model. This snow scooter can accommodate children from five to 15 years old. The ergonomic design will allow the user to learn how to scoot correctly. Also, the stable and quality construction of this snow scooter adds to the safety of the rider. It is made out of solid polyethylene is built to withstand the snow and other surfaces. The bindings of the model are adjustable to suit the height and weight of the rider. Also, the stylish graphic of this snow scooter will make you want to use it every day. It’s a great gift idea for your preteen kid. This snow scooter will be their key to better snowboarding for years to come. This simple-looking snow scooter is made out of polyethylene. Safe and durable, you can rest assured to make the most out of it while on the snow. The scooter can accommodate up to 200 lbs, the perfect scooter for both children and an adult who loves playing in the snow. One can easily zoom down any snowy hill with this snow scooter. This scooter is built to last for a long time with proper use and maintenance. Recommended age of the rider is at least eight years old and above. The Lakeside Collection prides themselves on the quality product to ensure safety while having fun this coming winter season. This model from IREKO will be your partner in both sun and snow while scooting. 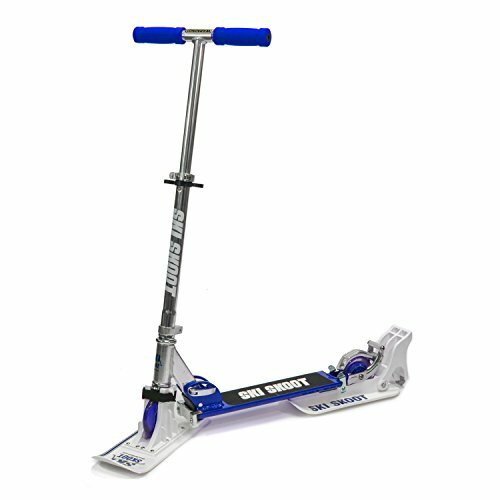 The standard kick scooter together with a ski skoot attachment can help you to start your snowboarding journey in safety and ease. Also, you can easily attach the ski skoot in just a matter of seconds with no other tools required. 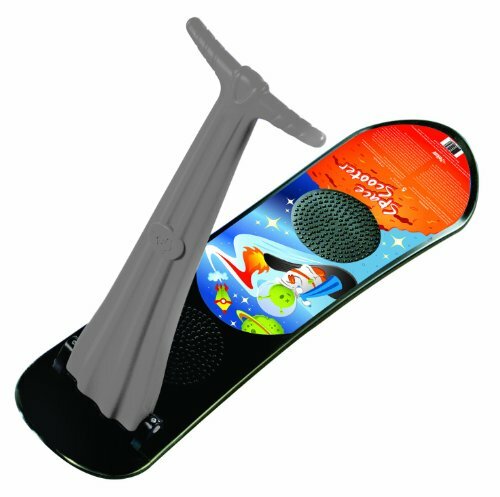 The ski attachment will allow you to glide smoothly even on heavy and deep snow. This model is safe for all ages. Children as young as five years old can use the product. It also comes with a rear brake for added safety and full control while riding. The folds can be closed for compact storage when you are done using the scooter. It’s also an excellent feature for portability and a lot of traveling. 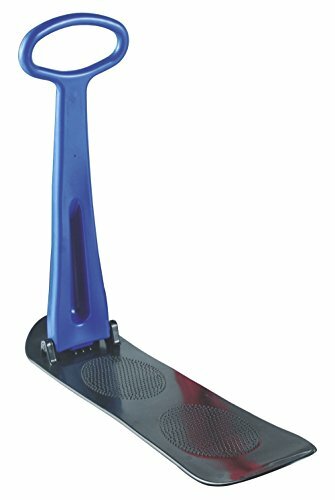 This snow scooter is constructed with durable plastic material to last for a long time. 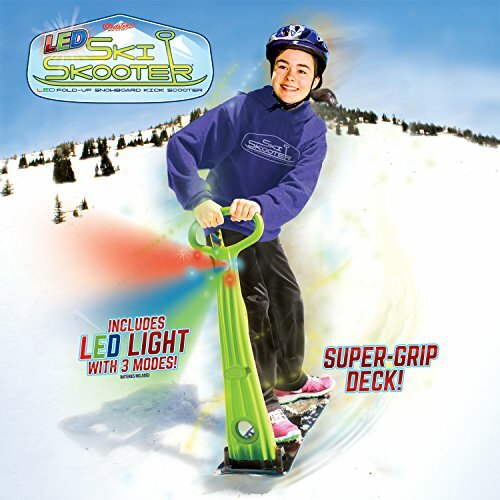 It’s an excellent gift for snowboarding enthusiasts and kids who love playing with the snow. The ergonomic design of the handlebars provides full control of the scooter when riding it. You can quickly fold the handlebars down for high portability. Store it in your car or garage when not in use. 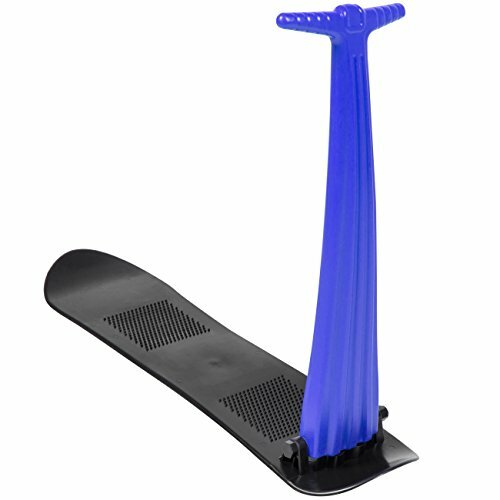 The anti-slip footrest of the scooter also assures your safety while you are riding the large snow slopes in your area. Issues of the handle being too low. 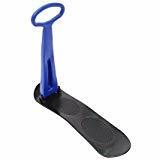 It is made out of durable plastic sled that will provide you with great fun and excitement for many years to come. The folding handle is a handy feature to adjust to the rider. Non-skid footrests of the model ensure the safety while you are riding it. This snowboard-style base is the perfect tool for you to use whether you are already experienced in snowboarding or merely starting out. The sturdy construction of the scooter can accommodate both children and teenagers riding this scooter. Considering the fact that snow scooters aren’t cheap, parents are warier in choosing the right model for their kids. Moreover, some are still contemplating and weighing the benefits that it could offer. Allowing your child to learn how to use a snow scooter at an early age can help improve their stability. Using a snow scooter requires an excellent sense of balance and direction, so as not to fall. Kids as young as seven-years-old can hone their balance skills by using a snow scooter during winter. Being able to maneuver the snow scooter by their own can also do wonders to the self-confidence of your child. Typically, it would take them less than a month to learn the basics of using a snow scooter. It is vital to develop the confidence of your child at an early age so they would grow up knowing how to carry themselves. It would also give them a boost to try exploring other skills too, now that they’ve succeeded on snow scooting. Snow scooting requires the use of helmet and other safety gears. By learning how to drive a snow scooter, your child will be able to determine the concept of safety at an early age. What’s more, is that the application of his learning is not only limited to snow scooting but in other activities as well. Teach your child to be independent while outdoors by introducing a snow scooter to their lives. Snow scooting will require motor skills that your child can develop in the long run. It taps their creative side and helps them to learn while having fun. Snow scooting will also take their attention from gadgets and TV. The first thing that you should consider is the durability and build quality of the snow scooter. Snow scooting can be dangerous if the model is not made of high-quality materials. You can tell that a snow scooter is durable at first glance with the quality of materials used. It should be seamless, sleek, and the material should not feel cheap. You may also inquire about the manufacturer of the materials used for this model. The snow scooter must have a reliable brake mechanism. Make sure that it has all the safety features that your child will need when riding. Additionally, some manufacturers offer a snow scooter that comes with a helmet and other safety gears. Look for a snow scooter that is both stylish and functional. Do not ever compromise the safety of your child over a sleek design. There are many models with elegant designs and excellent safety features. Also, you might want to choose a color that is easy to see from the distance if you’re going to monitor your child while playing. We understand that not all families live near a mountain where you can enjoy snow slopes anytime you want. Therefore, it is wise to buy a snow scooter that is easy to fold and portable. In that way, you’ll be able to bring it anywhere you want. It should not consume much space when stored since snow scooters can only be used during winter. But remember that snow scooters with folding design are prone to stability issues than stationary snow scooters. Lastly, look for a snow scooter that is easy to maintain. You might not want to own a scooter that’s easy to rust, after being stored during the summer. Snow scooters with less moving parts mean less maintenance and lubrication. Make sure that you follow the manufacturer’s instruction in keeping your snow scooter well-maintained when not in use.